Quinoa is one of those nutritionally dense super foods that you either love; hate, or have never tried. A few years ago, quinoa came onto the culinary scene in a big way and is now found everywhere and in everything from appetizers to desserts. Quinoa (pronounced “Keen-wah” not “kin-no-wa” as my mom says) is a flowering plant with edible seeds originally found in the Andean region of South America. Although the seeds have been cultivated and grown as a grain crop for thousands of years it has only been grown in the USA since 1983. As a crop, quinoa is not a true cereal grass like wheat, corn, rice and oats — but is a non-grass pseudo-cereal like buckwheat and amaranth and is gluten free. Nutritionally quinoa’s biggest claim to fame is that it is the only plant based food that provides all nine essential amino acids, making it a source of complete protein (perfect for vegetarian and vegan diets). You can find quinoa in almost any grocery store in white, red or black varieties, as well as, packaged blends and mixes. There is even quinoa flour for gluten free baking. For the novice, it is important to note that quinoa seeds have a natural pest deterrent coating that contains bitter tasting saponins. Most commercially processed quinoa have been treated to remove this coating but it can still taste bitter unless you thoroughly rinse the seeds before cooking. Another trick is to lightly toast the seeds in a dry skillet over medium heat until they just start to brown and get a nice toasty aroma — then cook in boiling water per package directions (my son swears by this method). Since then, I have made quinoa a regular part of our weekly menu and have used it in dozens of recipes. Quinoa can be a great gluten free replacement for breadcrumbs in meatloaf or meatballs — or a stand-in for rice in casseroles and stuffed peppers. Cooked in water or broth quinoa makes a delicious side for entrees and can be served under ragouts or braised items instead of rice or couscous. I’ve even used quinoa instead of bulgar to make a passable tabbouleh salad. However, my favorite way to enjoy quinoa is to make these wonderful pan-fried patties as a side dish. Similar to a latke (potato pancake) or fritter, these quinoa patties are crispy on the outside and tender and savory on the inside. They are a perfect addition to grilled meats or broiled fish or can stand alone as a light meal alongside a green salad. 1. Cook 1 cup quinoa in 2 cups water or broth per package directions (about 15 minutes). Pour cooked quinoa onto a large plate, spread out and let cool to room temperature. 2. Thaw frozen chopped spinach (use the microwave) and place in a strainer and squeeze as much water out as possible. 3. In a large mixing bowl combine the Italian seasoning, salt, garlic, pepper and flour – whisk together. Add cooled quinoa, spinach, chopped onion, eggs, and Parmesan cheese to the bowl and combine thoroughly. Using about 3/4 cup of quinoa mixture hand-form 10-12 small patties 3″ round x 1/2″ thick. 4. Heat a large skillet over medium heat, add 2 TBS olive oil to hot pan and swirl to coat, lay patties in the pan about 1/2″ apart (cook in batches if needed). Cook patties undisturbed for about 6-8 minutes. Turn over and press down slightly with a spatula. Allow to cook undisturbed for another 5-6 minutes until patties are deep brown, crisp outside, and firm in the middle. Remove from pan and place on parchment lined plate and keep warm until all patties are done and ready to serve. 5. Serve the patties alone or as a side dish (they are really good topped with a little Greek yogurt or sour cream mixed with some sriracha sauce). Happy Father’s Day to any of my readers that are dads. 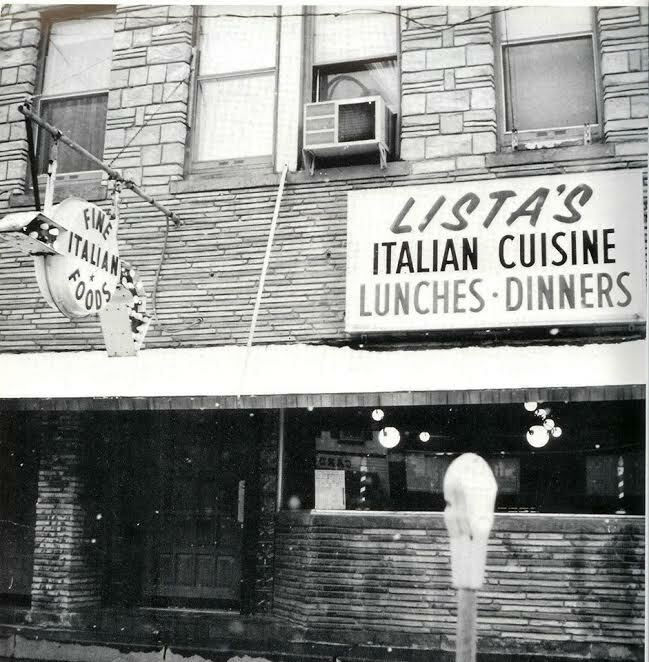 I’m forever grateful for my dad, Vinnie Lista, who was a strong influence in my life especially teaching me to appreciate great food and giving me the experience and skills to create and cook the great recipes I feature on this blog. Thanks Dad… you are always in my heart. Spiedo (no not the skimpy swimsuit) the Italian word meaning “spit” (like cooking over a fire) is the root of the name spiedies — a marinated and grilled meat dish created in the Binghamton NY area. This dish is so popular that thousands of visitors have flocked to Binghamton for the annual Spiedie Fest & Balloon Rally for more than 30 years. Based on the Italian dish spiedini or spidducci (in Abruzzo) which is made with cubes or balls of goat or sheep meat flame grilled on skewers. Spiedies came to Central New York through Italian immigrants who created the local dish in the 1920’s. Growing increasingly popular between the 1950’s and 80’s this grilled meat on a stick has become a regional favorite. Originally made with marinated lamb or beef, today’s spiedies are predominantly chicken or pork — while some home chefs like to use venison. Whatever meat is used, the real secret to a great spiedie is the marinade — a closely guarded secret for some of the Binghamton area’s more prominent spiedie producers. A combination of oil, vinegar, lemon, salt, spices, and herbs are used to marinate the meat from 1 to 3 days before skewering and grilling over charcoal. Although the formulation varies, a true spiedie marinade will feature basil, oregano and mint. Like many regional foods there are the originals, the close to authentic, and the poor knock-offs. When it comes to spiedies any recipe made with bottled Italian salad dressing is not the real deal… so stay away. Marinating the spiedies is easy using a zip-top freezer bag — put the meat cubes and marinade in the bag; smoosh it around a little bit to make sure it’s all coated, press out the extra air and seal. Then refrigerate overnight and until ready to grill. You should wait until you’re ready to grill before putting the marinated meat on skewer. Of course if you want to take the spiedies to a picnic and grill them there, make up the skewers and wrap them in plastic wrap, keep them on ice until you arrive at your destination then get grilling. My personal favorite recipe is below and I prefer pork spiedies (just because I do) but chicken, beef, lamb or venison all work equally as well. Traditionalists will serve the spiedies on a thick slice of soft Italian bread (using the bread to pull the meat off the skewer). A good Italian sub roll works great or even a hot dog bun in a pinch. Of course you can eat the spiedie right off the spit or serve it over some rice or noodles if you want. However you make it give spiedies a try at your next cook-out… you’ll be glad you did! 1. Trim and cut pork into 1 inch cubes and place in a gallon size zip-top bag. 2. In a small mixing bowl, whisk together olive oil, vinegar, lemon juice, minced garlic, basil, mint, oregano, salt and pepper — set 1/2 cup marinade aside and keep in refrigerator until ready to use. 3. Pour remaining marinade over the pork in bag and seal. Massage the bag to ensure all the meat cubes are coated with marinade. Loosen one side of seal and squeeze out the excess air, reseal and refrigerate overnight or longer. Turn bag every so often if possible. 4. Preheat grill to med-high (charcoal should be ashed over — gas grill should be at 400 degrees). 5. When ready to cook, thread marinated pork cubes onto soaked bamboo skewers (about 6-8 pieces per skewer) until all pork cubes are used. Place spiedies on the hot grill and cook until all sides are slightly charred and meat is thoroughly cooked (reaches a temp of at least 165 degrees) about 20 minutes total. 6. To serve, place one grilled spiedie on a slice of bread and while gripping the meat, pull the skewer out leaving the meat cubes in the bread. Drizzle with some of the reserved marinade if desired. There you have it my take on the Central New York favorite, Spiedies. Allowing the meat to marinate for at least 24 hours brings the true essence of the original spiedie to the dish. Grilling over charcoal is best but a propane grill is just fine — oven roasting can’t get the same flavor so don’t bother. Serve your spiedies on some good Italian bread as a sandwich or over rice. Drizzle some fresh marinade over the meat when serving, or add some grilled hot peppers or a dash of hot sauce if you want to spice it up. Give this regional favorite a try and I think you’ll make them again and again. Enjoying lunch with a good friend this week at one of the many local diners, I ordered a Greek salad consisting of: lettuce, tomato, cucumber, onion, pepper, kalamata olives, feta cheese and grilled marinated chicken breast. It was a good salad and one of my usual lunch choices — but that salad got me thinking about another favorite food from the Mediterranean: Falafel! So, taking a departure from my usual reminiscing about Lista’s Italian Cuisine, my family’s Italian-American restaurant — today I wanted to feature this culinary staple from that Middle East/Mediterranean region. Falafel is not just a popular New York street food, it is one of the most popular foods in the Middle East and a national dish of Israel. I first encountered falafel (and Middle Eastern foods in general) on a trip I took to Israel in 1990. About the second day of my week long tour of the Holy Land, my group stopped in a street market for lunch and I had my first falafel from a cart vendor. I remember the man using a common box cutter to slice the top quarter from a pita pocket and stuff in three walnut sized falafel, followed by “salad” consisting of chopped cucumber, tomato, green pepper, and onion — then a squeeze of tahini (sesame seed paste) sauce, and as requested a squeeze of “charif” (hot sauce)… and finally a handful of french fries stuffed on top. After eating the fries, I got down to business and took my first bite of the falafel and I was instantly hooked on this amazingly delicious regional food. Most recipes for falafel are made with chickpeas (garbanzo beans) with spices and herbs, however, my favorite local Mediterranean restaurant makes their falafel using chickpeas and fava beans. I wondered about this combination and after doing some research found that due to Favism (a genetic enzyme deficiency found in some people of the Middle East and North Africa) the use of fava beans caused sickness and was mostly discontinued and replaced with the chickpea. This local restaurant also adds sesame seeds to their falafel which I really like for the added texture. Unlike many other sandwiches or hand-held foods, falafel is one that isn’t generally tried at home. Admittedly, I hadn’t made my own falafel before coming up with the recipe featured here. Most authentic recipes call for dry chick peas that are soaked overnight and then mashed or ground… this seemed too much work to me since there were cans of chick peas in my pantry. Also, falafel is typically deep-fried — and as I’ve mentioned a few other times, I prefer not to deep-fry in my home (it’s messy). So I did a lot of reading and set out to make my home-made falafel with the convenience of canned beans and pan frying. Needless to say I had a few failures before I found the right ingredients and method to make a falafel that taste great and can be made the day I crave it. That is not to say that making falafel isn’t time and labor intensive, because it can be. But these are a few tricks that I found to help me get really good results. First, I opened two cans of chick peas and drained them in a strainer, then placed them on a paper towel lined platter and allowed them to air-dry for a couple hours (I found this step helps with the texture of the finished product). Next, I got all my other ingredients out and put them close at hand (as the French say, “mis en place” — everything in its place). Finally, when I cooked the falafel I used a six inch frying pan with about 1/2 inch of oil to shallow fry them in batches. I chose to use canola oil for frying and I used a one ounce cookie scoop to portion the falafel — which I flattened slightly into disks that were roughly 1 1/2 inches across and 3/4 inch high. I served the falafel with lettuce, tomato, cucumber and onion — and topped them with tahini sauce and charif sauce (see below). The results were delicious and we ate every last one. 1. Drain the chick peas and spread about 2 cups on a paper towel lined platter/tray and allow to air-dry for 1-2 hours. 2. Meanwhile chop onion, garlic and parsley and add to the bowl of a food processor – pulse until finely chopped (scraping bowl as needed). Empty into a mixing bowl. 3. Add sesame seeds, flour, egg, cumin, coriander, baking soda, cayenne and salt to parsley/onion mixture and combine thoroughly. Set aside. 4. Add 1/2 the chick peas to food processor and pulse until finely ground but not a paste. Add to mixing bowl. Pulse remaining chick peas until coarsely ground (for texture) and add to mixing bowl. Mix ingredients together until everything becomes cohesive (sticks together). Place in refrigerator until ready to pan fry. 5. In a small (6 inch) frying pan, heat about 1/2 inch of oil (I used Canola) over med-high heat until shimmering. NOTE: at this point you need to test the mixture by frying one falafel first — if it starts to fall apart in oil then add 1-2 more TBSP flour to mixture and try again. 6. Using approx. 2 TBSP falafel mixture, form 16 to 20 walnut sized balls. Gently place 4-5 balls into hot oil and flatten slightly with a fork into disks about 1 1/2 inches round by 3/4 inch thick. Allow to fry undisturbed for 5 minutes and turn over and fry for another 3 minutes. Falafel should be dark brown and crispy outside. Continue frying falafel in batches and drain on paper towel lined plate. 7. Serve falafel in warm pita pockets with lettuce, tomato, cucumber and onion. Drizzled with tahini sauce and/or charif (hot) sauce. Enjoy! To make Tahini Sauce: In a small bowl whisk together 1/2 cup tahini (sesame seed paste) with 1/4 cup water, 2 tbsp lemon juice, 2 tbsp olive oil, and a pinch of salt. To make Charif (hot) Sauce: In a blender combine a can of diced tomatoes (drained), 1/4 cup vinegar, 1/4 cup olive oil, 3 cloves garlic, 1 tsp cumin, 1 tsp salt, and 1 or 2 tsp cayenne pepper. Blend until smooth. There you have it, my version of Falafel that I think taste wonderful and are fairly quick and easy to prepare. These are good stuffed into a pita for the traditional street food experience, or on top of a simple Mediterranean style salad, or as an appetizer served with dipping sauce (tahini sauce, charif sauce, tzatziki (yogurt sauce) or even ranch dressing). With a little patience and practice I think you’ll find great results from these recipes.